Reading over Ephesians 4 over and over again the past few days has led me to pray for God to do a much needed work in my life. “I therefore, a prisoner of the Lord, urge you to walk in a manner worthy of the calling to which you have been called, with all HUMILITY and GENTLENESS, with PATIENCE, BEARING WITH one another in LOVE, eager to maintain the UNITY of the Spirit in the bond of PEACE” (Eph. 4:1-3). Look at what I am called to live out every day of my life. Humility. Have I ever had any humility? Gentleness. Anyone who knows me well knows this is never a term that would be used to describe me. Patience. Nope. And the older I get, the worse it seems. This shouldn’t be! Forbearance. This one I really am in the middle of learning, but I am a slow learner. It often involves shutting my mouth and taking my own selfish, ugly heart to the Lord instead of to another person. Love. Just learning how God loves me constantly reminds me of how my love pales in comparison and fails others. Unity. Often I am more concerned about myself than the unity of the body. Peace. Oh, I say I want it, but am I EAGER to do what it takes to maintain it? Like denying myself? Lord, I am Yours. Do in me all the work that needs to be done so that I look more like Your Son who exemplifies all of these character traits perfectly. Forgive me when I choose to live contrary to Your way as put forth in Your word. It’s a choice. A sinful choice. Make my heart grieve over the sinfulness of those choices. Thank You for Your great patience with me in this work. Please show me progress occasionally so that I am not discouraged. Thank You that I can read Your word, every single day to remind me of the work You are accomplishing and want to complete in my life. Thank You that the work needed is dependent on You for You are faithful. I just need to be like Paul, enslaved to You so that I may walk worthy of Your calling. I have been attending church pretty much every Sunday since I was nine years old. I am not uniq ue in that… I am sure many of you who are reading this can say the same thing. My church did indeed preach the Gospel. Salvation was offered to those that trusted in Jesus Christ and believed that He was born of a virgin, lived a perfect, sinless life and was crucified on the cross to pay for the debt of sin that mankind had committed. He rose from the grave three days later and now sits at the right Hand of God. All an individual had to do was ask the Lord for forgiveness and accept Him into their life. This is still what I believe. However, growing up in a church that tied the reality of your relationship with Jesus Christ based more upon the length of your hair and your basic overall appearance is not what everyone else experienced. The church during that period of time was caught up in what was commonly called “legalism”. The word “legalism” does not occur in the Bible. It is a term used to describe a belief that emphasizes a system of rules and regulations for achieving spiritual growth and evidence of salvation. The truth is, however, even true believers can be legalistic. As a believer who has endured the worst that can come from the judgment from other believer’s, I can speak with authority on this subject because I am a recovering legalist. 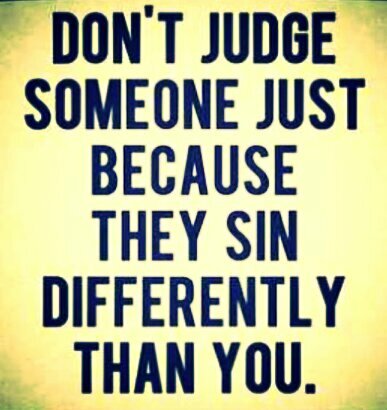 I spent a good portion of my life judging other people in their walk with Jesus Christ. For many years, I sat back and did my spiritual evaluation of other believer’s, all the while my own spiritual flaws were masked and hidden by my own self-righteousness. It is one of the greatest shames I carry in my life. I have always said that my greatest failure in life was not the fact that my first marriage ended in divorce. My greatest failure is that I was part of something that judged and hurt those that struggled in this life. I am a recovering authority on the subject of legalism. However, it is not the intent of this post to cover all the issues that come with this subject but I do want to discuss a few of them. I have always referred to the principles of legalism as “the list”. It was the first thing we gave to new converts. The list was made up of all the things that you were supposed to do and not supposed to do if you wanted to keep God happy and remain spiritual. Most of the things on the list were good things—some of them even came right out of the Bible. But some of them didn’t. They were passed along to me from several sources, some from the traditions of my church, some from my training and education but mostly they were instilled in me by my Pastor. I was “taught” that if I did the things on the list that my life would be good. It was like a bill of goods…if you invested yourself into keeping the list you could reap the benefits of God’s blessings and find true happiness in this life. I bought it… hook line and sinker. 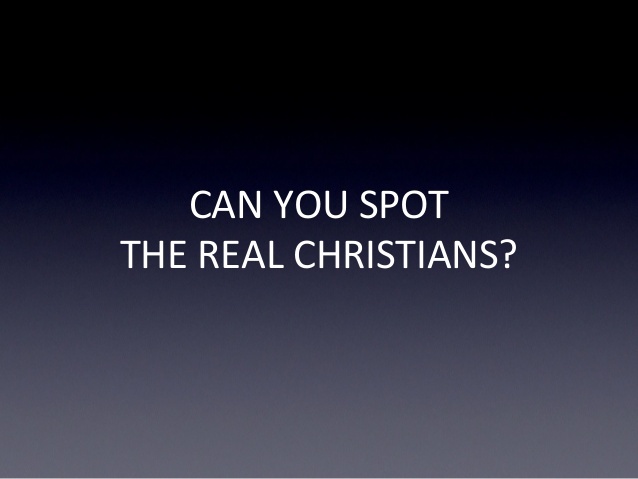 The “list” really came down to one question: “Real Christians don’t ______? '”(You fill in the blank). Jesus died and rose again, martyrs were split in two, and the Church has prevailed for almost two thousand years against the gates of hell so that Christians today can live out this ever important testimony to a waiting, watching world to tell themselves that… Real Christians don’t ____? Well, I believe it’s time to get a few things straight. The world isn’t waiting for Christians; the world doesn’t care. In fact, by a large margin it is only other Christians that care about what other Christians do or don’t do. Why have Christians made such an important issue out of keeping to this list? I believe it’s because we want something clearly identifiable that will distinguish us from the world. We want to be different. 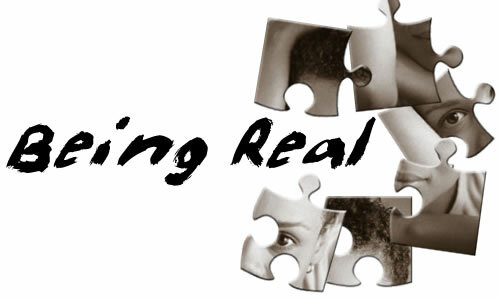 We want being “born again” to evidence itself in some clear, tangible way in our world. That much is good, but Godly men and women have historically distinguished themselves in much more important ways than keeping a list of do’s and don’ts. Christianity gravitated to this list of do’s and don’ts because it spells out the distinctiveness so clearly. However, the problem and the danger at hand is that being born again can become a simple matter of following a prescribed formula as opposed to living a vibrant joyful walk with Jesus Christ. Not that there aren’t any do’s and don’ts in the Christian faith. The New Testament is full of directives for Godly behavior. But the Biblical guidelines are much different from the ones found in popular Christianity, and it doesn’t take a genius to figure out the difference. Which is easier to follow: Real Christians don’t envy or Real Christians don’t dance? Which one gets noticed first: Real Christians don’t lust or Real Christians don’t smoke? Which is harder to comply with: Real Christians love their enemies or Real Christians go to church on Sundays? To tell a believer that they cannot dance, smoke and that they should go to church each and every Sunday is easy to define and expect from a believer. Obviously aspects of behavior such as envy, lust and loving our enemies are so much harder to define and to follow. I can maintain the “list” and still fail in the envy, lust and loving my enemy’s part and many other tenets of God’s desire for my life. 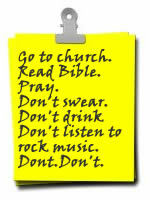 Truth is…I believe maintaining a list of do’s and don’ts is a dangerous way to assume Holiness and approval from God. But that is not how the legalist sees it. The legalist creates their own manageable system of weighing and measuring people. They become like the Pharisees, who regulated righteousness into a long, involved list of steps and procedures, cumbersome indeed, but fulfillable. So, in many of our churches, I’m afraid it comes down to maintaining this list of: Real Christians don’t ______ for many believer’s. They never have to grow past the need for the list and never really have the need to learn or experience what grace truly is. There isn’t any need for them to do so. Don’t you think Jesus Christ died for something more? That being said… many of the principles on the list were good ways to live your life and I am sure good ways to keep you on the right path. But surely they were not absolutes as they were presented. More importantly none of them had virtually nothing to do with my salvation. Without sounding like an immature Christian, the length of my hair, the music I listened to or the fact that I went to the “movies” should not have defined my Salvation. What it actually did was reduce my spiritual walk to a list of bare-minimums-I-have-to-do-to-be-a-Christian. I struggled with keeping up to the tenets of the list. My spiritual life was at best “yo-yo ” Christianity. Keep the tenets and all was good… fail at one and you were failing and falling fast away from God. My walk with the Lord was filled with up’s and downs. Mostly downs because I couldn’t keep up to the standard of the list. It did not keep me from trying…I was taught the list was the key to my successful walk with Christ. The problem was what the list did to my Christianity. It became way too much about performance, and not enough about the reality of having a personal relationship with Jesus Christ. “Spirituality” became more of an issue of conformity and obedience rather than living out the fruits of the Spirit as God intended. The progression of the list leads to what I call “the line”. The line is when you consistently keep the tenets of the list. When a person kept enough of the list to be what they felt was “spiritual” they could draw a line of distinction between themselves and from those who did not. If a person could make it to the line, he could feel good about himself and his personal relationship with God. By measuring up to the line, a person could feel like he was good with God. And he could also feel like he was better than others. I cannot help but think of it as spiritual arrogance. But sadly “the line” leads to “the look”. Appearances became the most important part of life. And what was seen on the outside was prioritized over what was happening on the inside. It’s not that some good things weren’t happening on the inside in my life—they were. But things like peace, love and joy weren’t as important as the Bible says they should have been. And no one was judging my spirituality by that. They were judging me based upon the tenets of the “list” and how close I was to their “line”. Both of these things made the “look” all the more important in my spiritual walk. 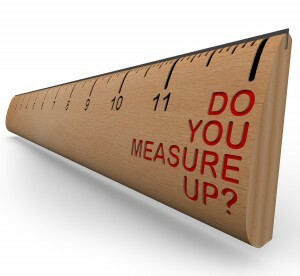 When you are a legalist, you spend a lot of time evaluating others, making sure they measure up. What does their “list” look like? Does their list include all the important things that are on my list? And where is their “line”? Is it up there where it should be? Or could I consider myself more spiritual since my line is higher? And do they “look” like they should? Or could I look down on them for looking weaker than me? All masked in the name of spirituality, when in actuality it was judgmentalism. Many Christians wait and watch to be entertained by the latest episode of spicy details in the rise and fall of another believer. What we have here is not just another failure of a believer but clearly an in-house problem among our body of believers as a whole. 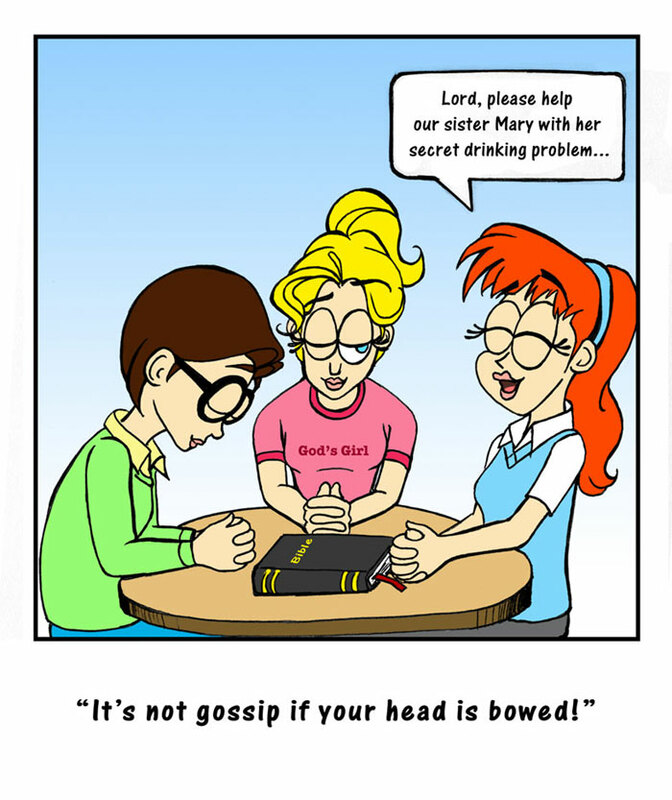 From my personal experience, sometimes the greatest gossip opportunities are the very “prayer meetings” we have in some of our churches. Prayer requests masked in the intent to “share” a little of what we heard or know about the failure of another believer. Nothing but plain gossip if you ask me… but that is another discussion for a different time and place. Following a checklist rules reveals something else: it reveals a lack of faith in God’s leading in the lives of others. It says, “My confidence is in man’s teachings” rather than in Christ alone. But God has a much better way. His way requires a daily surrendering of our will to His. His way bears fruit. It’s not burdensome and it’s not bound by legalism. Ironically, I’ve been wrestling lately with the flip side of being a recovering legalist. I struggle with judging and being critical of those who are caught up in throes of legalism. I find myself making fun of them. I find myself even thinking that I am somehow superior to them because I see the error of their way and I found the right path. This type of judgement is just as bad. It shows my attitude and posture towards other Christians in whom I perceive the tendencies of legalism. Christ has been so patient with me, yet I’ve not always been as patient with them. Instead, I’ve become so preoccupied with what I perceive to be their tendencies toward an imbalanced judgement of others and a separatist denominational spirit that I’ve sometimes lost sight of God’s grace in their hearts and ministries. This too is a legalistic tendency and needs to be erased from my life. I also see that attitude among other believer’s that have come out from that background. The very same haughtiness and judgment that I have witnessed in those that held to legalistic rules and regulations I see in those who are critical of legalism. They have no idea that they are just as guilty. Thank God for Grace… after all, it’s His work, His power, and His presence in our everyday lives that becomes our true source of confidence and strength as we follow Him together. I am still in recovery and I have a way to go. But now instead of keeping my eyes on the deeds and actions of others, I will fix my eyes on cross of Calvary. I am starting to see forgiveness much differently than I have in the past. In the past I would simply ask God to forgive my unforgiveness of others… the older I get I see that God wants me to ask forgiveness of those that I have something against. Like Jesus Christ who forgave those that betrayed Him, I need to forgive those that have done me wrong. So if you can relate to this story, please let me know… there is strength in numbers. I need to continue my path to recovery and your invited to come along for the journey. Maybe we can all find forgiveness along the way. Is God Good All The Time? Really? 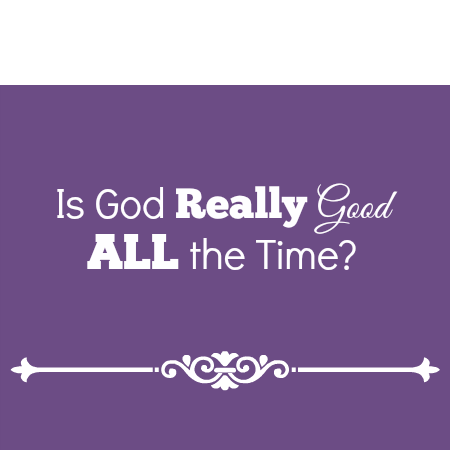 How do you answer the question, is God good…all the time…really? So what is the good we are talking about? What does it mean that God is good? Does it mean that things always go my way, work out for me and that I am always healthy, always happy, always have all I need? Are my circumstances the good we are to focus on? I have watched some who would have called themselves Christians teeter on the brink of belief when faced with the question, is God really good? I listened to a man I have prayed with many times tell me that I could go ahead and pray for his loved one if I wanted to but that he didn’t see that all that prayer was really doing any good. I saw that whatever measure of faith he had to that point was broken. As far as I know, he is still reeling. I wonder what this man and many others like him expect from God. Much like this man, I know that when I was young my idea and expectation from God was much different from what it is today. When I was young I expected God to make everything I touched be a success. I prayed to win the game, I prayed that “She would like me”. I prayed for God to keep me from getting caught when I had done something wrong… God was like my “get out of jail free card”. Because God was good… He HAD to bless me and take care of me. That was what my sister and I prayed as a blessing over the food when we were kids. We were ingrained with the idea that God was innately good. Abundantly good. A quick look around our childhood proved this idea correct. We had abundant food and though we may not have been setting the fashion trends in our school, we had plenty of clothes and a roof over our head. My sister and I never doubted that God was good. Why would I have even questioned if God was good? In addition, that was what I learned in my church. For many years, I have heard it repeated over and over again. Not to play devil’s advocate here, but would God cease to be good if your tests revealed cancer ? What if you were the lady who waited on a Godly man but remained single? What if you didn’t get the job? Is God still good if your family seemed to be the only one not spending a week at the beach this summer? If your church was on the edge of irrelevancy, would you still say that God is good…all the time? 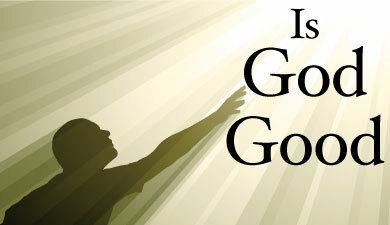 Or maybe–if you have identified your current situation in the above scenarios–I should ask, is God any less good? What happens when bad things happen to good people and good things happen to those who are bad? Is your faith journey a “what have you done for me lately” faith? Does God ever get a break from blessing you in order to–I don’t know, maybe cor rect you or teach you? Is God more of a genie in a bottle, ready to bless you if you can just figure out the right formula to control Him? How little difficulty does it take to derail your faith? We need to answer these questions so we can honestly answer the all important question of whether God is really good all the time or not. Do you want me to wrap it up, give you a nice, neat answer? One that can give you the secret to turning on the uninterrupted faucet of God’s goodness in your life? I’ve prayed fervently with a clean heart for friends with cancer. Some have survived that evil monster; others have succumbed to it. I have witnessed men of God, preachers, that have prayed fervently to remove the burden of depression in their life, only to have the prayer seemingly go unanswered. I know of Godly, faithful men and women who have lost a child at birth. I have sat in the living room of the parents that have to deal with the loss of a daughter… taken way too soon from this earth. I have personal friends that are widowed way too soon in this life. I have witnessed some really bad things happen to people who were faithful to God. I say yes. Not in a childhood yes kind of way or a Christian cliché kind of yes, but yes, nonetheless. What we really need to understand and accept is the fact that life is hard. God never promises that we will not endure the pain that this life can give. As a matter of fact, God tells us that we shou ld expect it. If we don’t accept that simple idea we will find ourselves disappointed, bitter or worse….we will give up on this faith walk with God. The truth is that “God is good” is not at all about my circumstances, but is all about His nature and His character. Because He is good even my difficult days are a blessing because a good God is in charge of my life. Because He is good I can endure financial troubles. Because He is good, cancer can be part of His kind work in my life. When I make His goodness about my circumstances I will quickly become disillusioned….but when I make His goodness about His nature and how He deals with me then even bad day, difficult problems and health issues change because a good God rules my life. Is God good all the time? YES! And even when life isn’t so good, wonderful, sweet, loving and good God is working through it all for my good and His glory. So… is God Good All the Time? 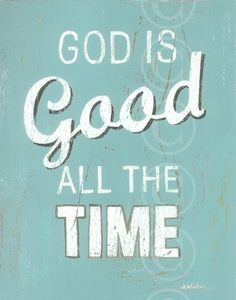 God Is Good… All the Time… …and All the Time… …God is Good! That statement was made not about the latest weight loss plan or gizmo bought from a late-night infomercial. No, that statement was made about prayer. The person had evidently asked God for something important to him, and he didn’t get it. So prayer obviously doesn’t work. To tell you the truth, I wasn’t completely sure whether this guy was being completely serious with me. But he was serious enough that I didn’t quite know what to say. That was the problem with the guy who tried prayer and it didn’t work. He didn’t do it long enough. Consider the story of Zechariah and Elizabeth The book of Luke describes this couple as not only “righteous;” he also said that they followed “all the Lord’s commands and decrees blamelessly” (Lk 1:6). These were pretty good folks! The problem was that Zechariah and Elizabeth had no children in a culture that valued children so much that being childless was a “disgrace” (1:25). This Godly couple had been praying for a child (1:13), but they had grown “very old” and their prayers for children had not been answered. Yet. God had not told them “No.” He had said, “Wait.” The problem was that God’s “Wait” felt just like “No.” The birth of their baby John was such a shock and surprise to them that it is obvious that they had not been praying this prayer for some time. God answered their prayers, but He did so in a way that fit with His plan and His purpose for them. Their prayers were answered at the proper time… but after a long period of waiting. 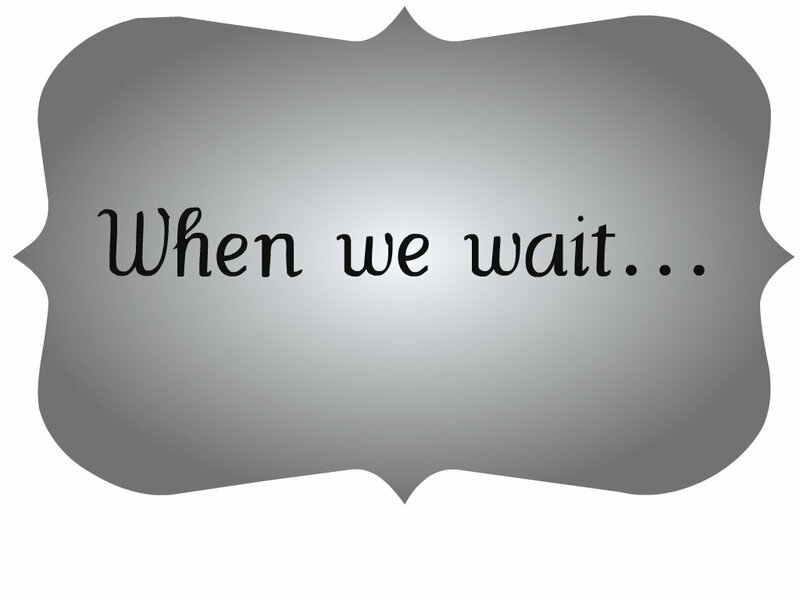 Let’s face it, it’s hard for us to wait upon the Lord (Isa 40:31). We get weary of waiting, and we see the passing of time as proof that God has forgotten all about us. His silence FEELS like He has forgotten us. We can see God’s purposes in the story Zechariah and Elizabeth because we read their story from the beginning to the end. But we live out our story from the middle— and we have to wait for God’s ending. We can never tell the difference between God’s “No” and God’s “Wait” until we get to the end of our story. God is not a vending machine where we pop in a prayer out pops our blessing! But when we struggle with something in prayer, we needed to remember that “Wait” does not mean “No” even though they feel the same at the time. Remember the story of Zechariah and Elizabeth. God works in His time, not in ours! When I graduated from college I received a gift. 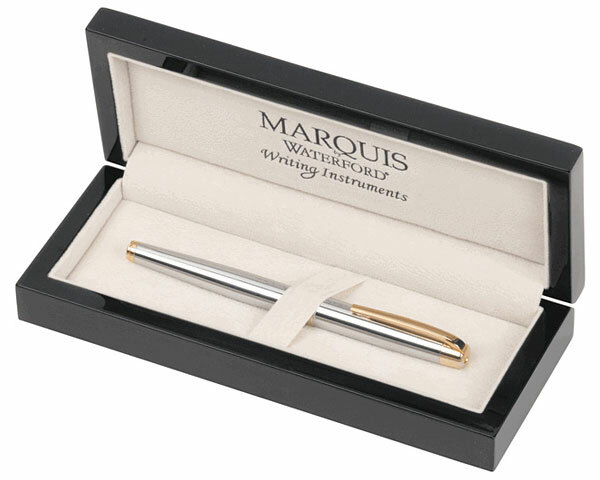 I slowly opened the box and pulled out the Waterford pen. It felt great in my hand and immediat ely I knew that it was meant to tell stories. It was meant to share thoughts, beliefs, feelings and perspectives. It was meant to be used. If you have never held a Waterford Pen then I guess you will never know. All it and I needed was a blank piece of paper. I started to write. I wrote about everything. I wrote about growing up in a small town. I wrote about my family. I wrote about losing a brother. I wrote about my college experiences. I re-told stories that my grandfather shared with me. I wrote about my future dreams and how I truly felt about the things in my life. I wrote everyday and I kept my musings in note-books and hid them so that no one would ever find them. I was embarrassed, afraid that someone would find them and expose my thoughts and feelings. My life story hand-written on paper. Nobody ever knew that this was what I did in my spare time. That was over 30 years ago. Long before there were computers in every home. Long before word processors and the internet. Long before the advent of people even having “blogs”. Unfortunately… life got in my way. Responsibilities of a young father and a man trying to save his struggling marriage sapped any desire and passion I had for writing. I just simply stopped and put the pen down. 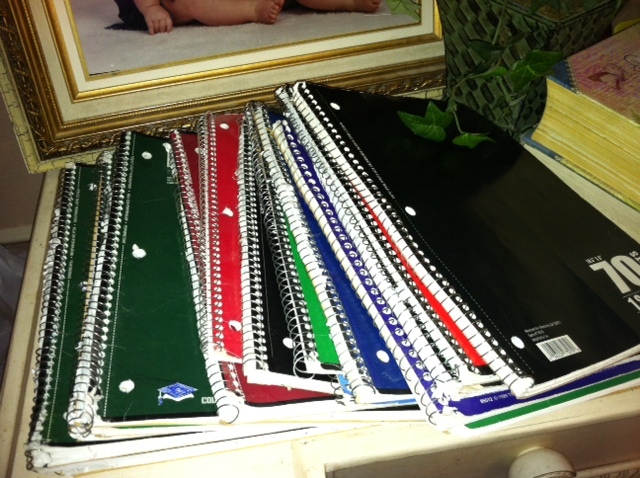 I hid my notebooks and today I assume they are where I placed them all those years ago. That location will be a secret I take to my grave. I am sure that some of my “best” writings are embedded somewhere in that “buried treasure”. They will stay where I put them. I have no desire to unearth them and relive the raw feelings and perspectives of that time in my life. Simply stated… like almost everything I had in this life, I lost it in my divorce. That included my Waterford Pen. For almost 20 years I really did not write much more than my sign my name. I swallowed any desire or passion I had about writing. There were times during that period where I wasn’t really sure I was passionate about anything. But as the years have passed, I have found I still have a few passions in my life. Today, I am still passionate about my relationship with Jesus Christ. My wife, Pam is the primary focus of my earthly passions. I want to live the rest of my life making sure she is happy and taken care of. My children and grandsons are extremely important to me as well. I still find myself being passionate about listening to music. I listen as much as I can. There is a sense of urgency for me because I fear that with my onset hearing loss there may be a day when the music will be silent to me. The bottom line is that after all this time, I still find that I am passionate about writing. I am still drawn to write. I started writing this blog on September 3rd of 2008. My original intent was to re-write some thoughts and stories that I had written so many years ago. I wanted to write them down and store them someplace where my children and grandchildren could read them one day. I never really intended to have anyone else read this except them. I just started to write and one thing led to another and the next thing I knew I had over 100, 000 visitors to my blog. I then said that I would continue to write until I had 200,000. I reached that goal and really did not set another goal. I only told myself that I would keep writing until I lost the motivation and/or came up with another outlet for me to express what I need to share. I am now closing in on 500,000 visitors to this site. As I have always said, I love to write… I never said I write well. I know that as I strain to remember some of the stories that I wrote all those years ago, the details got lost in the fog of time. I don’t remember like I used to. Some stories blur into one and the end result is something different from what really happened. I can’t change the fog of time… the senses dull and some of the details will be lost forever. That doesn’t mean I have nothing to say. I write much more than I ever post to this site. I have over 250 rough draft posts sitting in my file. Waiting for me to review and just waiting to be posted. Most will not ever be posted. Sometimes I guess, I worry about being too interested in the writing aspect as opposed to the content and if what I write really helps people when they read it. 1. What am I trying to say? 2. What words will express it? 3. What image or idiom will make it clearer? 4. Is this image fresh enough to have an effect? I think I fail at all four points but I am reminded that George Orwell did not write his two master pieces (Animal Farm, 1984) until close to the end of his short life; leaving the planet at 47 from a severe lung disease. Orwell did not start to write until he was in his late 20’s. But once the decision was made, he tackled the task like a man possessed. Most of what he wrote was never published. Orwell lived a short life though his body of work is still being sorted through by academics and historians, because writing was his passion, and he wrote every day…and the pages go on and on. Now I do not compare myself to Orwell. The only similar aspect that is even remotely similar to Orwell is that I try to write everyday. I’ve been DRAWN to and COMPELLED to write for most of my life. For the most part it is crap, but it’s my crap…and I will simply continue to do it. I mentioned a few posts ago that I have a critic. Someone who keeps me humble in my writings. He told me (and I quote) that, “My writing was a stain on the white shirt of society“. Now for the record, like most people, I am a person who likes to be liked. BUT… if you don’t like me I am okay with that as well. It is alright for someone to not “care” for me. I have a list of people I am not too fond of myself. I do not wish them any ill, I just would prefer to let them live their life and I will live mine. That being said… I did want to point out that while my critic may be right about my writings, he missed the whole point of my blog. I am not trying to be a writer. In the end, really, if nobody ever reads my work that’s alright. It is the act of writing itself that gives me the most pleasure. Writing is my passion. Writing makes my heart soft and pliable towards the things of God. I believe to have a passion in one’s life is important; somehow passion gives us Meaning to our lives in this huge universe. So… if my writings are truly a “stain on the white shirt of society” than so be it. It’s my passion and that is just fine with me. 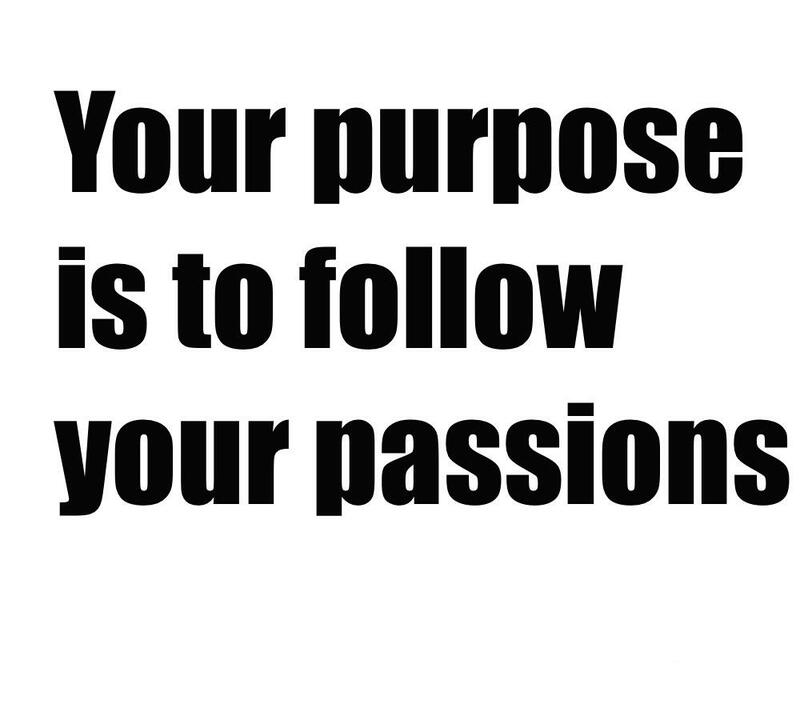 The question is… what is your passion?